When I create abstract art, I think of it as a creative way of expressing my emotions. It is a therapeutic approach to recycling the images, events, sights and sounds of this world into something (hopefully) beautiful. Who knows? You just might discover a means of expression you’ve been craving for quite some time. Have a productive week, and enjoy yourself today. Peace. I love the colors you chose for this painting. They radiate peace, peace, peace. Thanks, and you the same! This is a lovely piece, Laura. We certainly all do need a peaceful place to relax and “go to”. I love this peaceful place of yours! Thanks for sharing!! Great line about “the art police.” I think I’m always looking over my shoulder expecting them to be glowering at me. Peaceful and soothing color combination. Like thought bubbles floating up wishing peace upon the world. Lovely Loo. Abstract can be so challenging. I keep dabbling a bit unsuccessfully I truly enjoy looking at it but struggle creating it. Jodi, when emotions are high, give it a try. I find my best stuff comes from emotions running high or low. I feel like you’d be a stone-cold natural, as you have a wonderful sense of balance and color. And you feel things so deeply. I also wonder if what you’d call unsuccessful would be wonderful to us! You know that thing about the stuff you didn’t like or didn’t wanna post and everyone loves it. Happens to me a lot! My emotions are so on the surface and usually running to one end or the other (vs in the middle, where I’d prefer them), but I think that helps. Or maybe study the work of someone you admire, like Debora Stewart. Can’t go wrong with her! I’d love to see you do more abstracts, I’ve really enjoyed the ones I’ve seen of yours. I like this very much. I’m digging the circles. Thank you, Kirk. That’s a really fun gesso resist, if you ever feel like trying it. 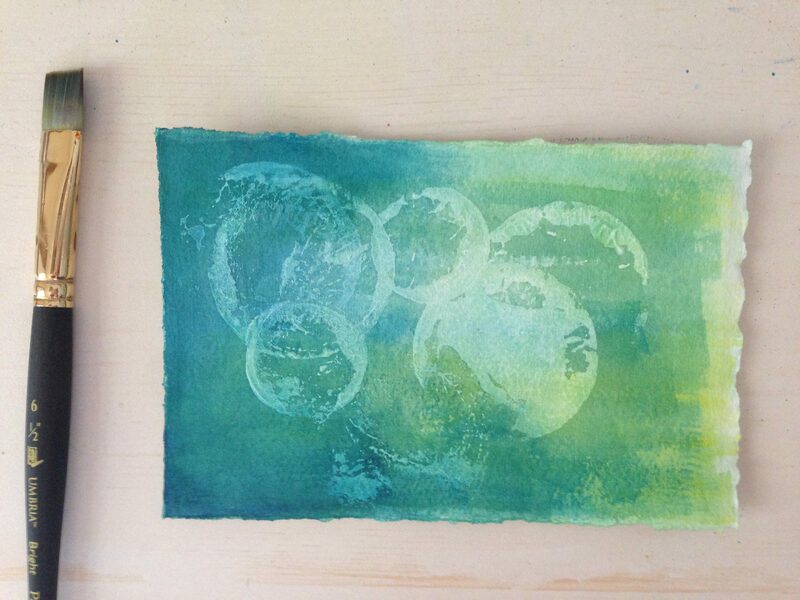 Paint a background, one color is fine, and then once it’s dry, take something round like a bottle cap or some things you like the shape of, dip it in gesso, stamp it on your surface, let it dry and then the watercolor will resist it (for the most part) and you get that cool textural effect. Really easy and fun. Laura, Thank you! I appreciate the step by step. I always want to try this abstract stuff that you do but it always looks so contrived, very unlike the cool images you produce. Your step by step directions give me hope. Kirk I watch lots of youtubes and look at art books and I get ideas. I think having been a quilter, I have a color foundation and that always helps. Have you ever tried playing music while painting? I’m glad you liked the step by step. I hope you try it. Thanks Laura, that’s what I was going for. I think that would make another great greeting card. Do you save some of these little ones or do you recycle them? It looks like a rotation to me…like the main ball represents the earth and the other 4 are different positions as it goes around in a circle. Thanks Dawn, it was fun and gave me a peaceful feeling as I painted it. Crud, I would do business size size too if I was using good paper. I am picturing a little mouse at an easel. That would be cute! Make sure to wear a little French hat like the mouse does. Uhhh….Bueno? I don’t know French. I used to, lol. A little. Laura, I like your encouraging people to express themselves abstractly or at least in art in general. It would be fun to hear about your process…I know that we tag along with you with your experimenting but you know, your process of how you get to where you get in creating. I love the freedom of creating an abstract and letting loose, not knowing what I will get. The only thing that keeps me hesitant is the idea that I am using more paint and the cost of it. I need to stop this because regardless, paint is used at some point. I might have to give my airbrush paint a whirl because I have enough of it. 🙂 Oh, I saw your comment to DawnMarie that you are going small with wc because of confidence. I would suggest that you slowly increase your size. I did that…..I rarely paint 4 x 6 inches anymore…..I still paint 7 x 9 but basically I go straight to 11 x 14 as my standard size. I never thought that I would be doing that! never! It has taken me months to build up the confidence. Anyway, just giving you an encouragement to go just a tad bigger. Thanks, Margaret, always appreciate your feedback. Honestly, as beautiful as your realistic work is, I’m always blown away when you post an abstract. When you connect to your feelings about the river and about God, as we saw in that amazing pastel, you just fly straight up and we all want to be up there with you. Just an observation. As I discover myself, more and more, to be an abstract painter, and as I think we all seek to be understood, particularly in our artwork, I hope to show people about abstract art, that it really isn’t something that any 5 year-old can do, but at the same time, it is attainable, too. Idk, probably not making much sense but feeling a little like I’m on the Island of Misfit Toys sometimes with my love of abstract. And I want to welcome everyone to the island! It’s not such a scary place, as I think people imagine. Neither is it a place only for kindergartners. And there really IS a point, and yes, I DO have to think when I paint abstractly. It’s not just easy and a snap for me. But I’m often more proud to show my abstracts than anything I’ve painted representationally. Re process, I think you raise a great point there and maybe it’s down to my mood a bit, with all of the news and that, I feel I used to talk more about my process. Or at least how I came to that piece, something. Yesterday, I just wanted to get this post scheduled and get back to painting. Feeling the need to recycle times a thousand right at present. You are correct, abstract is not easy and it takes thought and work. Tapping into the inner self and spirit is part of it and not a lot of people are aware of their inner life. I want to explore it more and more because I do feel like I let loose and live richer. I think so….and because I do struggle with the outcome of my art, with abstract I can focus more on the expressing and releasing what is inside without having any barriers or borders (representationally) So funny because I don’t consider myself an amazing abstract painter….lol thank you for that! yes….go bigger even if you take it inch by inch. Yes! This is exactly why I’m drawn to it. And you definitely are amazing; I don’t throw that word around. And thanks re inch by inch. Will do. Thanks for sharing your wisdom. Ok and IMO you should explore it more because you’re amazing. Seriously. Wonderful post and beautiful piece!😍 Love the idea of “color your way to freedom”! Wise advice in this crazy world. I think art may be the only way any of us can make sense of it. Charlie, you are so right. And even still, it makes no sense, but at least I can shove it to the background for awhile and focus on things that are above for awhile. And come out with something that I can call pretty, at least. For now, it works. I appreciate your time and thoughts, bro. A good post, design and choice of colors. Put this one in a frame! Thanks, Carmel! Much appreciated, friend! Boy, you said it Susan. Amen. Thank you so much whoaglund, for taking the time to tell me that. Spreading smiles is so much fun! 😃 glad you enjoyed. Just got home and saw your post, it made me think of geli plate printing, have you tried the geli plate? I have not used mine in ages, I think you would enjoy it, take a peak at you tube demos if it is new to you. Very inspirational words too. I’m a little afraid of it, but maybe that was just fear of acrylics in general……I’d love to see what you’ve done with it! Don’t be scared of it, it really makes the process quicker, think of it as a tool. I don’t think I can even get to mine, it’s on a shelf hidden behind art clutter!! If you know what I mean? Very cool and calming, just what is needed. I’m going to dive into some abstracts.